Ken Johnson’s songs have been recorded by many artists including Harry Connick Jr., Uncle Kracker, Tyler Farr, Chris Janson, Craig Morgan, Clare Bowen, Josh Thompson, The Farm, Joey and Rory, Ty Stone, Josh Grider, Lisa Lambe of Celtic Women Group, Walt Wilkins, Wayne Newton, and Paul Sanders with Vince Gill among others… Past hits include Josh Thompson’s “Beer On The Table” and Craig Morgan’s “Still A Little Chicken Left On That Bone”. More recently, his songs “Summer and 16″ and “White Van” both went #1 for 2 weeks each with popular Texas artist Josh Grider. He has written multiple songs for television shows like “Nashville” and “Hart of Dixie”. In 2012, Ken released “Dang Good Day” in association with Warner Chappell Music and Combustion Music. The album features collaborations with singer/songwriter’s like Randy Houser, Frankie Ballard, Josh Thompson, Brothers Osborne, Sarah Buxton and Eric Paslay to name a few. Ken has performed on TV’s Good Morning America as well as The Tonight Show with Jay Leno. Look for new releases this Fall with Harry Connick Jr., and Chris Janson. Ken’s song “You Dream I’ll Drive” with Josh Grider is now approaching top 10 in the Texas regional market. Ken, along with his wife Andi Zack-Johnson is also half of new children’s music duo, Huck and Lilly. Their album “There’s A Tree Growing In My Room” co-produced with multi Grammy and Dove award winner Skidd Mills, is available now at iTunes. Ken and Andi are also cast members of a new Ryan Seacrest production called “I Love Kellie Pickler”. The show debuts on CMT Nov. 5th. NEW Hillbilly Supper Club recipes coming August 4th from “I Love Kellie Pickler” Season 3! For my wife Andi and I, it has been a joy and a pleasure being a part of the cast of two seasons now of Ryan Seacrest Production, “I Love Kellie Pickler” on CMT. We have really enjoyed working on the show with our dear friends. One of the things we love about the show is that it is often is about shining a light on others and their talents, their passions and what they have to offer to the world. Kellie and Kyle have said from the beginning that they wanted the show to lift up others. It is in that spirit that I would like to use this week’s Hillbilly Supper Club blog to shine a light on my friend, Chef Stephen Bucalo. Stephen is the Executive Chef at The Hub. This wonderful beach venue is a gathering place for friends and family (and dogs! ), located along beautiful scenic Highway 30A in Watersound Beach, Florida. It is a multi-mix venue with several restaurants all under the direction of Chef Stephen. The space also hosts the Gulf Coast’s largest LED Jumbotron, where sporting events, movies and live-recorded concerts are shown. We love to watch college football games on the big screen and get some BBQ and cocktails on Saturdays in the Fall. There is a faux grass lawn for corn hole, lounging and screen watching. You can enjoy indoor or outdoor seating, relax by the fire pit or by the fireplaces in the screened in porch & get a drink at one of the two bars onsite. On top of all of that, my good friend, Ashley Grimes, Director of Marketing and Events at The Hub is on her game when it comes to live music and manages to bring in some of the best national touring artists around during the vacation season 5 to 6 nights a week at no additional cost to Hub customers. Wednesday nights are reserved for family movie night and a picnic. Fun for kids and adults alike all in one place! One of the favorite Hub restaurants Stephen takes great pride in is called “Local Smoke”. The BBQ is pretty great. I asked Stephen to share his very popular brisket recipe with us as well as his approach to “Burnt Ends”… a very sought after delicacy in Texas and now in the Florida panhandle that you don’t find everywhere. 2. Prepare smoker and adjust vents to set heat at 205 degrees. Use preferred wood… mesquite, cherry, pecan or hickory are all good choices. 3. Place brisket in smoker and smoke for 12 hours* maintaining 205 degrees throughout. 4. Remove from smoker and allow to rest for 30 minutes. *You want to aim for about 12 hours for cooking your brisket. However, it may take as little as 6 hours or as much as 18 hours to reach an internal temperature of 180 degrees depending on the heat distribution of your smoker. Using a meat thermometer, monitor temperature while your brisket is cooking. It should work out for you to cook your (13 to 14 lb) brisket at 205 degrees for around 12 hours… Chef Stephen says… “ Shoot for 12 hours, but no matter what, even if it’s after 6 hours, once it hits an internal temp of 180 degrees, pull it off smoker and let sit for 30 minutes to rest.” After 30 minutes, you can wrap in foil and return to a warming drawer or oven set at 160 degrees until ready to serve. Slicing across the grain will give you that tender, pull apart signature brisket goodness! Serve with sauce on the side or as a sandwich with the side items you prefer. Potato salad, baked beans, collard greens, mac and cheese, squash casserole slaw, pickles etc. First of all… what are “burnt ends”? When you cook a brisket, some parts of the cut of meat are thinner on the outside of the cut and when done, tend to be cooked more perhaps losing all fat content. However these parts of the meat, when mixed with sauce and smoked an additional amount of time, become more tender and offer a delicious almost concentrated intense smokey flavor. Burnt ends are considered a delicacy in southern cooking circles and are excellent when chopped and added to baked beans or on sandwiches or on their own. Dice ends of brisket into 3 to 4″ cubes. Toss cubes of brisket in sauce and put in oven proof container then return to smoker for about six hours at 205 degrees. Stephen serves them on top of good ol’ fashioned white bread with extra sauce drizzled over the top. His customers seem to be pretty ok with that. In the southeast it’s all about the pork and Stephen can do that like nobody’s business but he started out as a student of Texas BBQ which is all about the beef. That means using dry rubs during cooking and then adding sauce as a condiment. “Your bbq should speak for itself” he says. “The sauce is just a little something extra”. 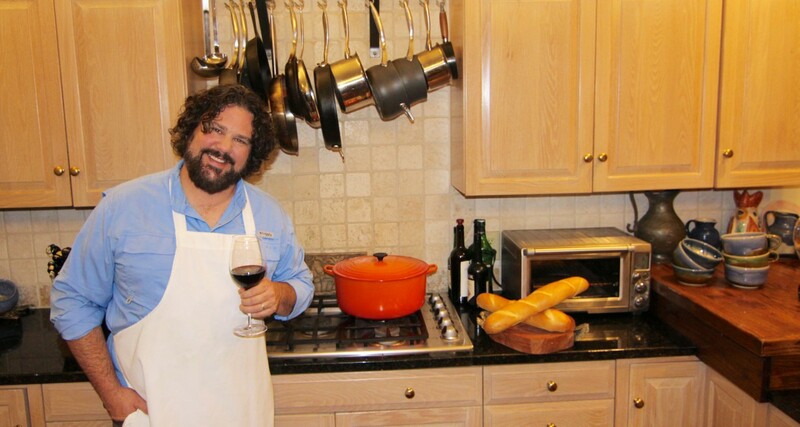 Stephen Bucalo is an all around good guy and a 2002 graduate of the Western Culinary Institute in Portland Oregon. He is recognized by his peers as an expert in the “farm to table” movement and was head chef of the critically acclaimed, Fox Brothers BBQ in Atlanta Georgia before being “whoo’d” over to The Hub in early 2016. This past week my wife Andi and I went to New York City with Kellie Pickler and her husband Kyle Jacobs to promote CMT‘s ILoveKP. While there, we were all in the audience of the television show, “Harry”, where Kellie was a guest. Much to my surprise, I was asked with a moment’s notice to perform a duet with Harry Connick Jr. by the man himself. This came about as a spontaneous move on Harry‘s part after Kyle told him that I was in the audience and was one of the writers of “Every Time I Fall In Love”; a song Harry recorded on his new album, “That Would Be Me”. It was a little nerve racking with only a minute to think about it but I couldn’t pass it up and I knew I was very fortunate to have an opportunity to sing with him. It was quite an honor to say the least. So… For this week’s Hillbilly Supper Club, in honor of Harry Connick Jr., I thought I would take it to NOLA with some cajun inspired cooking. Thanks to my cowriters Sarah Buxton and “Big Al” Anderson for writing the song with me and thanks to Kellie and Kyle for including me that day. It was a special moment for me and I won’t forget it. Setting each ingredient on the list out on the counter first makes preparation much easier. Use fresh or previously frozen wild shrimp if possible for best results. Delicious served with steamed white rice and french bread and a crisp, dry white wine or cold ©Abita Beer. Add raw peeled and deveined shrimp and 1/2 of cajun seasoning. Stir well to coat shrimp evenly with butter and seasoning. Using your hands combine softened cream cheese, monterey jack cheese, chopped green onion, andouille sausage and the other 1/2 of cajun seasoning. knead and fold until well blended. Spoon cheese mixture into jalapeño pepper halves and arrange on baking sheet. Lay one or two shrimp long ways on top of each stuffed pepper then starting at one end wrap with bacon across to the other. Arrange on baking sheet and bake at 425 for 25 minutes or until golden brown. Serve over steamed who rice with Louisiana© brand remoulade sauce, hot sauce, chopped parsley, tomatoes and lemon wedge. I have had a lot of people ask me what recipes are the biggest hits at Hillbilly Supper Club so this week I am throwing back to one of our favorite dishes from Season 1 of “I Love Kellie Pickler”. The texture and temperature of food will be more on point as well as the appearance. This dish may seem like a lot of work but is actually quite simple if you have your ingredients out and ready and someone to share a glass of wine with while you cook. Might be helpful to give the recipe a good read through first to familiarize yourself with the process. This dish is a favorite at Hillbilly Supper Club. Keep on low to medium low heat until needed stirring occasionally. Lay fish out on a flat baking pan skin side down. Very lightly drizzle olive oil over the fish…and then rub over meat to coat with clean hands. Next, gently slide metal spatula between skin and fish and carefully flip. In a skillet melt butter on medium heat and add juice of fresh squeezed lemon, white wine and other half of fresh oregano. Whisk together and keep warm on medium low heat. Sauté asparagus for 5 minutes stirring often and reduce to low heat. In a skillet melt butter on medium heat and add juice of fresh squeezed lemon, white wine and other half of fresh oregano. Whisk together and heat. Next plate fish with salt and peppered side up on side of pasta and vegetable sauce…Sprinkle parmesan – reggiano over top of cream sauce and spoon lemon butter sauce over fish and serve hot. Accompany with fresh crusty bread and salted rosemary butter. After last week’s episode of “I Love Kellie Pickler” on CMT featuring Huck and Lilly, I thought it would be fun to post a couple of recipes inspired by Huck and Lilly songs from their album, “There’s A Tree Growing In My Room” which is available on iTunes… Yumbo Gumbo can be made the day before, refrigerated (or even frozen) and then reheated… No Problem. The flavors will come together more and more in the pot as they sit. You can add more or less stock depending on your own preference for thickness of gumbo. Huck & Lilly‘s “There’s A Tree Growing in my Room is available on iTunes! Very Important Step: Leave dough in the fridge for 5 hours. Roll dough and cut with a cookie cutter, sprinkle with sugar and place cookies on buttered cookie sheet. Cook at 375˚ until golden brown. These also can be dropped with a nut or jelly put in the middle. Be sure to listen to Huck & Lilly’s “Sugar Cookies” while you bake! Because They are just bound to come out better! Get it on iTunes here: While you are cooking watch Kellie Pickler, Kyle Jacobs, Allison & Dave Baker and Ken and Andi Zack-Johnson (AKA: Huck & Lilly) here! The butternut squash is often skipped over sitting there in it’s thick khaki skin in the produce section looking all boring but… it’s what’s on the inside that counts right? The bright yellow-orange flesh of the butternut squash is healthy and delicious and very versatile in the kitchen. Next time you are in the store grab a couple and make one of my favorite Hillbilly Supper Club recipes for this time of year. This week I am making a big pot of curried butternut squash bisque for my fellow cast members of I Love Kellie Pickler and a few other friends who are stopping by. I recommend pairing with a cold Good People Pale Ale and a football game! Place in oven for 45 minutes to an hour or until tender when pierced with a fork. Heat butter in a stock pot, on medium high setting. While continuing to simmer on low heat, add cream, salt, pepper, nutmeg and fresh thyme and stir well. Kimberly from Little Big Town teaching Kellie and Kyle how to “bohl” water and then put something in it. Every year about this time, thanks to Andi and Kellie’s garden, we have a bounty of tomatoes because we want to pick everything before the first frost. These end of season vegetable-ish fruits seem to pile up and take over. At our house they are sitting around the kitchen, ripening in window sills or on the kitchen and dining room tables in big bowls. A few late bloomers are still showing up on yellowing vines. They are everywhere… and kinda in the way. Though they may be a nuisance now, soon enough, we will really be missing our precious summer tomatoes. What a shame it would be not to do something with them. This is a sauce I make for Andi to then “can” in Mason jars so we can enjoy a taste of summer again when the winter comes. If you are not growing your own, go to your local tomato truck and buy them up to save some summer for yourself. Heat olive oil in a stock pot, on medium high setting. Add quartered tomatoes and reduce heat to medium. Continue to cook for 30 minutes stirring every few minutes. Reduce heat to low and add oregano, bay leaves, salt, pepper and sugar. Cover and simmer on low for 1 hour – stirring every 15 minutes. Tomatoes should slowly break down as sauce simmers. Very important to remove bay leaves and discard because they can be a choking hazard. Add basil leaves and stir in to sauce. Toss your favorite pasta with desired amount of sauce…add fresh grated parmesan reggiano cheese and you have the perfect comfort food! Canning is an excellent way to store for the winter. Slice green tops off of tomatoes. Boil a large pot of water. place tomatoes (4 at a time) in boiling water for 30 seconds at a time. Remove and immediately submerge in ice water for 5 minutes. Remove from icewater and tomatoes should be easy to peel by hand. Once you prepare all of your ingredients and set them out on the counter in front of you, you can make this fairly quickly and easily. “Riced” cauliflower is the result of grating a head of raw cauliflower on the side of a box grater (like you use for grating cheese). You get a large portion of what looks like white rice and when used in place of rice, can work well in some recipes. If you cook it first it will lose it’s firmness but if you mix it with hot stir-fried chicken and vegetables right before you serve it, it will be just right. This is a very flavorful and healthy way to get your asian food fix without so many carbs or heavy oils and you get a good dose of raw vegetables. I know it’s hard to believe but you won’t miss the rice. I don’t use cauliflower just because it is a rice alternative and low carb… I use it because it is good! I make this for my family all of the time. At Hillbilly Supper Club this is brotha Kyle‘s favorite dish but Kellie and some of our other guests don’t eat meat so I substitute vegetable broth for the chicken broth and set aside some of the vegetable and cashew stir fry with the honey/soy sauce mixture before adding the chicken so that there are options for everyone. Try it yourself and let me know what you think! Pepper and garlic from Andi‘s parents farm in Oliver, B.C. Heat sesame oil in a large skillet on medium high heat and add *1/2 of diced chicken and brown until just cooked through. Transfer cooked chicken to plate and set aside. Next, cook the remaining raw chicken the same way… Transfer that chicken to same plate. Next, Stir in green peas, water chestnuts and green onion… pour in (through a strainer if needed) 1 cup of spicy garlic ginger broth and reduce to low. Using the small cheese grating side of a box grater, grate all of raw cauliflower and set aside. Take reserved 5 red chili peppers and chop into very small pieces… place chopped red pepper in a small mixing bowl with soy sauce and honey and remain 2 cloves of chopped garlic…whisk until well blended. In a skillet on medium heat, combine chicken, remaining spicy garlic ginger broth and honey/red pepper/soy sauce mixture… coat chicken well and heat until steaming then mix with vegetables to combine all cooked ingredients. Mix in grated raw cauliflower and remaining cilantro (chopped) and serve immediately. *RE browning the chicken… Cooking all of the chicken at once in the skillet may make chicken a bit gummy and rubbery. If you cook 1/2 at a time there will be more room in the skillet it should brown nicely and have a better flavor. This is the case many times with proteins. Don’t crowd the skillet for better results. This week we are in the incredible Okanagan Valley wine country of beautiful British Columbia, Canada, where my wife Andi grew up, promoting “I Love Kellie Pickler” on CMT Canada. With the tremendous bounty available here this time of year on Andi‘s family farm, I thought it would be fun to bring some Canadian influence to Hillbilly Supper Club. The cuisine here reminds me in many ways of where I grew up in the south. Many of the same ingredients are used in the cooking and getting together around the table with family and friends after a hard day’s work like we do in the south is a big tradition here too. Yesterday, we explored the farm to see what herbs and vegetables were available to us. I hope you will enjoy making all three of these dishes that are a result the inspiration that always seems to come from a walk in the garden. I prepared the pork in the morning and placed in the refrigerator so that it would have time to absorb the flavor of the rosemary, fennel and garlic and to get the prep work out of the way so it would be ready to go in the oven later.The carrots and the chard will heat up again nicely if you want to make them ahead of time and refrigerate. This is a great meal for the beginning of Fall! We also determined without a doubt that this goes really well with a glass (or two) of good red wine. Place pork on a plate and rub herb and herb and garlic paste all over meat until completely covered. Cover with plastic wrap and let sit in refrigerator for at least 4 hours. Remove Pork from fridge and let sit on counter for 30 minutes. Place roast in baking dish and place in preheated oven (uncovered) for 45 min. Insert meat thermometer if desired and return to oven for an additional 30 minutes or until internal temperature reaches 140 degrees. While pork rests… scrape very flavorful bits from bottom of baking dish… Add a pat of butter to pan juices and stir in until melted. In a pot, combine broth, garlic cloves and salt and bring to a boil. Reduce to medium/low heat, add carrots and squash and cover. Cook for 20 to 25 minutes until soft. Add heavy cream, nutmeg and butter and puree with an immersion blender or electric mixer. Farm fresh veggies and a good farm dog named Jackson. After having access to Andi and Kellie’s garden all summer and now a whole farm, I am a little spoiled on fresh produce! The grocery store trip was a quick one after gathering most of what we needed right out of the back yard. These are all simple ingredients so that you can taste the food itself for what it is. Like they say… “God don’t make no junk” and these simple gifts from the farm will taste as fancy as the city when you invite your family and friends to the table. Just smile when they say “I don’t know how you do it”. The simplicity part can be your own little secret.